Unfortunately, I don't know Dutch to fully understand what this news piece says, but as I somehow understood from it - the Mayor of Rotterdam Aboutaleb together with Azeri Ambassador to Netherlands Fuad Isgandarov opened a memorial plaque in a Rotterdam street named after Baku. 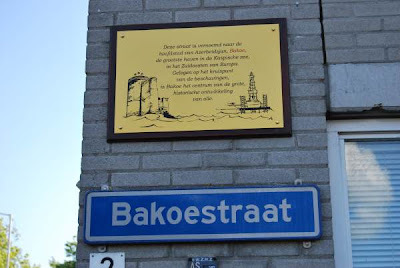 There has been a Baku street - Bakoestraat - in Hoogvliet district of Rotterdam since 1953, to my ignorance. And another fact I didn't know - ironically, Rotterdam's mayor appears to be someone named Aboutaleb. For Baku's mayor - rather the Executive Head as Baku doesn't have a real elected mayor - is named Abutalibov. What a pity that Burgemeester Abutalibov missed this ceremony!